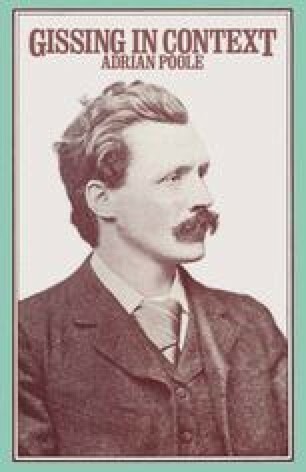 The significance of Isabel Clarendon (written 1884, but published 1886) in terms of Gissing’s development, has already been mentioned in relation to Demos. It represents Gissing’s first major break from the insistent urban context and fierce class tensions of his first two published novels. Yet for all its evident technical advances, Meredith was surely right in advising Gissing to get back from the country house to his proper setting. Isabel Clarendon is perhaps the best representative of a whole set of Gissing’s novels, that betray a fundamental rift between the ostensible theme and setting, and the animating emotions of desire and need. A Life’s Morning (1888), The Emancipated (1890), Denzil Quarrier (1892), The Crown of Life (1899), Our Friend the Charlatan (1901), Veranilda (1904), Will Warburton (1905) — all these novels offer some intelligent insights and moments of characterisation, without ever approaching the concentrated power that distinguishes the major novels. The most valuable aspect of these secondary novels lies in fact in the unexpected disruption of the apparently primary narrative action (the political elections of Denzil Quarrier the complicated religious wars of fifth-century Italy in Veranilda) by the revelation of intense individual need.